The 7 Flags Event Center in Clive, Iowa, will see Julius Anglickas vs. Clayton York. 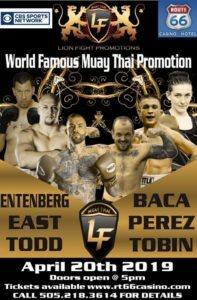 Anglickas has won 4-fights in a row, including submitting Erick Murray Jr. at LFA 42. The Lithuanian has 100% finishing rate. 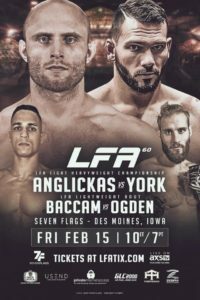 York is unbeaten and makes his LFA debut coming off a November submission of Justus Faaiu. The Oregon native has an 80% finishing rate. In the co-main event at Lightweight Anthony Baccam & Trey Ogden square off. Baccam has won 3 of 4, including stopping Ryan Stock and Jeremy Castro with strikes. Ogden has won 4 of 6 in the last 2-years, including submitting TJ Brown at LFA 21 and Travis Perzynski at LFA 34.